Author Interview: Rondi Lauterbach - Am I Called? The following interview is with an old friend, Rondi Lauterbach (Rondi is not old, the friendship is old!). She is the author of Hungry: Learning to Feed Your Should With Christ (P&R Publishing) and the upcoming correlating video series. With the book having endorsements from leaders such as Michael Horton, Nancie Guthrie, and Elyse Fitzpatrick, this is certain to be a series that refreshes the appetite of those seeking to not simply read God’s Word, but feast upon it. I grew up in Memphis, met my husband at college in New Jersey, then moved to Oregon for seminary and our first church. Since 1978 we’ve served in 3 churches where my husband was senior pastor, and a few others as an associate, mostly in the west and southwest. We’ve raised 3 children, who are all married, and now play with 6 grandchildren. That last part is pure fun. 2. 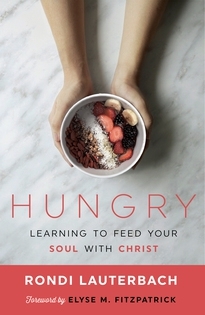 What prompted you to write Hungry: Learning to Feed Your Soul with Christ? What is it about? Who did you write it for? Hungry grew out of my desire–almost fifteen years ago–to encourage the women of our church to grow in their love for God’s word. Bible study reminded me of cooking a meal, and I thought the analogy would be both friendly and instructive. The second piece, spiritual hunger, emerged next. What do I do when I’m not hungry for God’s word? When, in fact, I’m hungry for everything else? The final piece of the puzzle fell into place when I recognized that it was seeing Christ himself in the Scriptures that satisfied me. That’s why I wrote Hungry: to connect the dots between our hunger and God’s plenty in Christ. young moms; so busy feeding everyone else they forget to eat. non-Christian friends; feeling empty but not knowing Jesus came to be their true food. 3. What do you think keeps people from studying God’s Word? I think there are two primary reasons. First, like any discipline, it can be hard. We know Scripture is “good for us,” but we’re not always convinced it’s good. Tasty. Satisfying. That’s why we study our Bible in fits and starts. When discipline fails us, we need to fall back on delight. The second reason is that busy people lack useful tools. Bible study can be presented as intimidating, only for the highly educated with free time. I learned a way to study that works for busy moms and working women. Hungry offers a simple toolbox for everyday use. Here’s a follow up question: What is it that brings people back to Scripture after being away? Trials. God brings us into the wilderness to make us hungrier for him. That’s when Scripture comes to life for most people. I spend a whole chapter on that topic. 4. Tell about the video series for the book. After Hungry was published, I taught through it a number of times. During those sessions I took the content deeper, explaining the theological underpinnings for each chapter. The video series grew out my desire to offer this resource to small groups. With the help of a local media company plus a crowdfunding campaign, we produced the twelve 25–minute sessions. They can be accessed for free through my website, rondilauterbach.com. DVD sets can also be ordered there for the cost of shipping only. To celebrate the video launch, P&R Publishing is offering the book for 50% off the list price of $12.99. Just enter the discount code “hungry” at checkout. 5. Any practical suggestions for Women’s Ministry Leaders on how they can help cultivate a love for Bible study in their churches? I’m grateful for our women’s ministry leaders. As they know, one size doesn’t fit all. Paul helps us with this insight: “And we urge you, brothers, admonish the idle, encourage the fainthearted, help the weak, be patient with them all.” 1 Thessalonians 5:14. Do you see these 3 types of women in your church? What would it look like to patiently pursue each type? Be on the lookout for the woman who falls through the cracks of your current approach. Be aware of those who have little available time. Small group studies that come with video can be a great help for women who don’t fit the traditional structure of women’s Bible study. 6. What book of the Bible are you currently studying? Do you have a favorite book/verse? I’m actually reading through the Bible in a year with the ESV plan. I used to be terrified of programs like that because my inner legalist joined hands with my inner perfectionist to make it torture. But right now I’m loving seeing how interconnected Scripture is. The character of God is so consistent from Genesis to Revelation. And the dramatic tension between our rebellion and his faithfulness so unrelenting. And the person of Christ so mysterious. I find myself on the edge of my seat even though I know how it ends! 7. What books are you currently reading? Right now I’m reading We by Yevgeny Zamyatin for a book club I’m part of. It’s a 1920’s future dystopia that inspired George Orwell’s 1984 and Aldous Huxley’s Animal Farm. In non-fiction I just finished Recovering Eden: The Gospel According to Ecclesiastes by Zack Eswine. Rich and helpful. I have a lot of other half finished, excellent books lying around, but alas so many books…. Rondi can be found on Twitter and Facebook. Previous articleWhich Preacher Has The Loudest Voice?